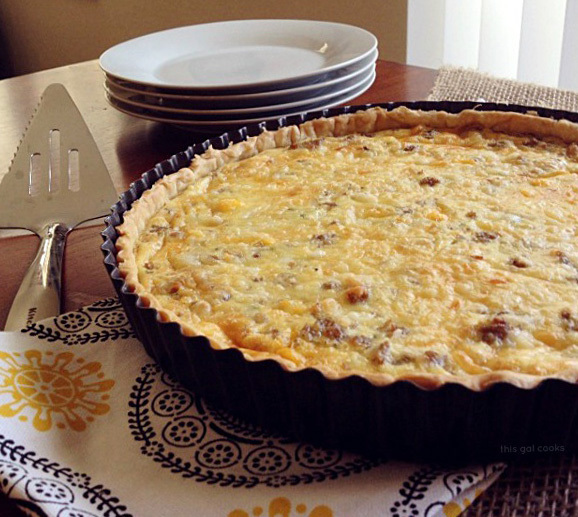 This Sausage Egg and Cheese Quiche Tart is a great make ahead meal that can be eaten for lunch or dinner. Simple ingredients that you probably already have on hand are all that are needed to whip this delicious meal together! I’ll admit it. Sometimes I can be rather lazy. I don’t always feel like making breakfast in the morning. And on the days I have to work, sometimes I don’t have time to make breakfast. When that happens, I usually end up stopping somewhere and buying something for breakfast. There’s a Panera Bread next to my job. The missing persons search can be called off. She’s at Panera Bread. Ha, I even go there for lunch sometimes. I’m surprised they don’t know me by name yet. Or maybe they do. At least they do when they swipe my little Panera card. I found the remedy to not having time to make breakfast in the morning. Make it ahead of time! Simple recipes like this Sausage Egg and Cheese Quiche Tart, this Breakfast Egg Bake Casserole and this Tomato, Bacon and Spinach Quiche have come to the rescue many times. Hey so what did you do this past weekend? I enjoyed not having to do any school work. The semester is over and I am free at last…free from school work until January! I didn’t really do anything productive this weekend, minus putting a few bookcase shelves together that I bought at Target. I put two in our bedroom as bedside tables and one in my living room to fill in some empty space. They look pretty nice. Our little house is coming together. Well, it isn’t that small but it isn’t huge either. OH. I also picked up some paint samples because I think we are going to paint the walls soon. I am sick of off white. I’m thinking a light tan will work perfect in our house! Press the pie crust into a 9 inch tart pan. Place in your freezer until ready to use. In a large skillet over medium high heat, cook the sausage until it is no longer pink. Remove from the skillet and set aside. Drain any excess grease from the sausage but leave whats in the pan in the pan. Add the onion and jalapeño to the skillet and cook until tender. In a mixing bowl, whisk together the beaten eggs,onion, sausage, cheese, heavy cream, seasoned salt and pepper. Pour into the tart pan, over the pie crust. Sprinkle with the parmesan cheese. Bake at 400 for 20-25 minutes or until set. A toothpick inserted should come out pretty clean. 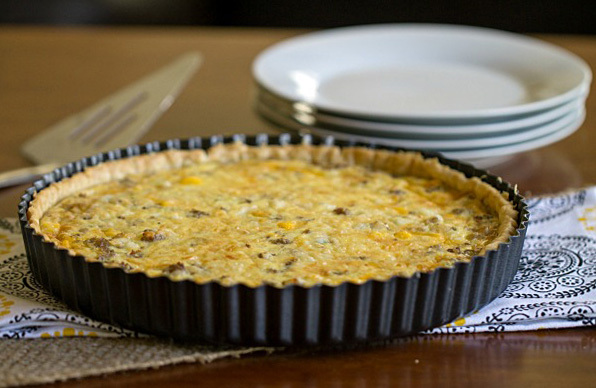 What is your favorite type of quiche? Not a fan of quiche? What is your all time favorite breakfast meal? You always have the best looking tarts Julie! Thank you, Nancy! They are one of my favorite thing to make! Looks delish! Making this tonight for my guy. Love this tart! This would make the perfect Christmas breakfast. Thanks for sharing, Julie! Great looking tart! I’m looking for a new brunch recipe for Christmas… pinning! Julie I am obsessed with quiches right now! So 70’s. I just made a spinach and smoked apple wood bacon one that is my new favorite. I’m making mini crab quiches this weekend for appetizers that I think will rock my world. Little home improvement work always brightens up the house, even just simple changes like changing the faucet fixtures really makes a difference. I’m glad to hear you have a break from school so you don’t have to deal with schoolwork. This quiche looks delicious! I always prefer the combo sausage and eggs instead of bacon and eggs so this tart totally speaks to me. :D Have a great rest of the week Julie. Yum Julie your quiche looks amazing! I love that you used sausage I always forget about it when it comes to breakfast, can’t wait to try this recipe soon. I love Panera! Thank goodness I have to drive 15 minutes to get to it. so, to make it ahead of time you just prepare it, and stick it in the fridge, then bake in the morning? and do you have to bake the pie crust at all before you add the egg mixture? sorry, I’ve never made one of these before, but it looks amazing!!! When I say make ahead, I mean make the whole thing! Say you want to have it for breakfast in the morning but don’t want to make it in the morning. Make it the night before, refrigerate it and then just heat it up the next morning! I just pop a slice in the microwave and heat it for about a minute. The quiche sure looks very good. I am a big breakfast fan but just keep it quite simple though. This might work so well for a holiday breakfast. 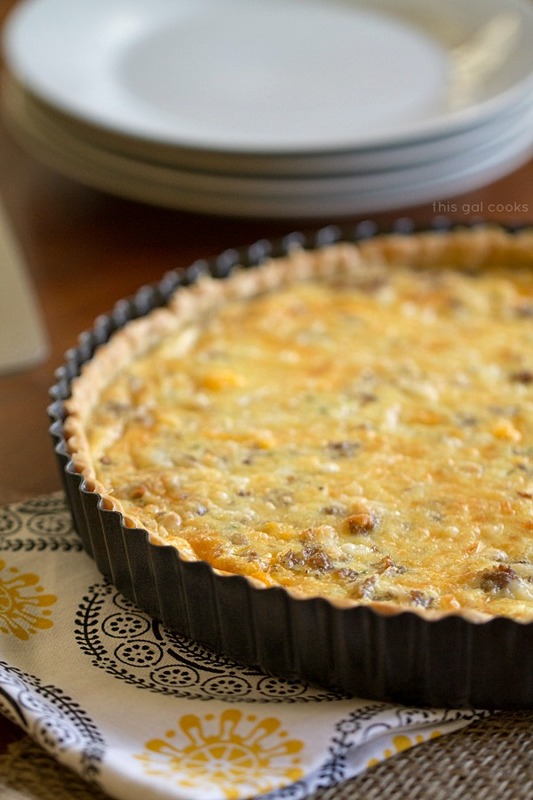 Stopping by from Show Stopper Saturday, your Sausage Egg and Cheese Quiche Tart looks fabulous, we will just love it. Hope you are having a great weekend and thanks for sharing. Thank you so much, Miz Helen! Hope you had a wonderful weekend! Mmm, looks delicious! Pinning, and thanks so much for sharing this at Creativity Unleashed! Hmmm… this may be added to my Christmas Eve brunch table! Thanks for sharing on the What’s for Dinner link up! My 8-year-old wants to make breakfast on Christmas morning – I wonder if I can convince him to make this…Thank you for linking up to the Creative K Kids’ tasty Tuesday – I can’t wait to see what kind of yummy goodness you come up with next week! Wow, that looks delicious. I can’t wait to try it! I hope you enjoy the recipe, Julie! This has everything my kids love to eat all in one dish. Thanks for sharing on Merry Monday. Pinned and will be including this in a Christmas breakfast roundup. Oh Yum! Thanks for sharing at the Inspiration Spotlight party. Shared. Happy Holidays! Definitely have to try this dish. Looks divine! Thanks for sharing at Funtastic Friday.